Radiotherapy masks can be heated in several ways, but the most common heating devices are a water bath and a dry-heat convection oven. The first one uses water to make the thermoplastic pliable, the latter uses dry heat. In this blog post, we give you an overview of common questions that may arise when choosing a heating device. It should be stressed that one is not necessarily better than the other, and that the choice between both heating devices depends largely on the personal preference of the radiotherapist. The questions below will guide you through the characteristics of both the water bath and the oven, which may help you in making a well-informed decision. How long does it take to preheat a water bath and an oven? How long does it take to heat up the mask? Can the mask be moulded right away after heating? How long does it take for the mask to harden? Are there any differences in the mask’s quality after heating? Can all types of masks be heated in both a water bath and an oven? How often does a water bath or oven need to be cleaned? How to make the most out of a water bath? How to make the most out of a dry-heat convection oven? Water bath: There are some differences between our American and European water bath. The EU water bath can take up to one hour to heat up when it is entirely full. The US water bath usually takes about 50 minutes. The water should be heated to 65°C-70°C (149°F-158°F). Oven: An oven preheats faster than a water bath, after 5 to 10 minutes it is at the correct temperature. We recommend to heat the oven to 75°C (167°F), but you can go lower or higher. Just remember that the heating times will change as the temperature changes. Both for the water bath and the oven, the heating time depends on the mask. For example, a Nanor mask of 1,6 mm will take 8 minutes to heat in the oven, while a 3-points mask in Efficast 2 mm maxi takes 10 minutes and a DUON HNS mask in U-Plast 3,2 mm will take about 16 minutes. Oven: It takes 8 to 16 minutes to heat a mask in the oven. Take care to not leave the mask in the oven for longer than 30 minutes, as this will damage the mask’s non-stick coating and may cause it to stick to the patient’s hair. Tip: In the water bath, you can always reheat specific areas of the mask by redipping. In the oven, this is not possible, but you can use a heat gun. Can the mask be moulded directly onto the patient after heating? Water bath: When using a water bath, you can start moulding the mask directly onto the patient. Tip: We recommend using a towel to take the excess water off the mask before proceeding to moulding, as this will be more comfortable for the patient. Do note that the process of drying the mask should not take longer than 10 seconds. Oven: When the mask comes straight out of the oven it is still quite hot, so it is best to wait 10 to 15 seconds before moulding it onto the patient. But there is enough moulding time, so this should not be a problem. Tip: You can always briefly touch the mask on the forehead of the patient to check whether the temperature is alright for them. The mask usually takes 10 minutes to harden, both for the water bath as for the oven. Neither the water bath or the oven affects the mask quality in any way, but the shrinkage levels may differ a little. Masks that are heated in a water bath tend to shrink more as they harden. They cool faster because of the water evaporation, which causes the material to shrink more. Also, the moulding times may vary. When using an oven, the moulding time tends to be a bit longer. For some radiotherapists, this is an advantage, for others a disadvantage. This depends entirely on the personal preference of the radiotherapist. All types of masks can be heated in both our oven and our water bath, but the heating times will vary depending on the type of the mask. 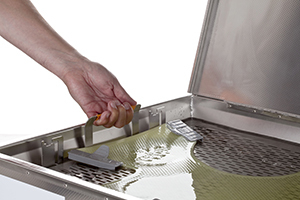 Water bath: A water bath should be drained and cleaned once a week. Depending on the patient volume this may need to be increased to two times a week. We recommend using distilled and de-ionised water rich in oxygen for heating thermoplastic masks. This will minimize corrosion to the stainless steel and will help to maintain the long-term reliability of the bath. 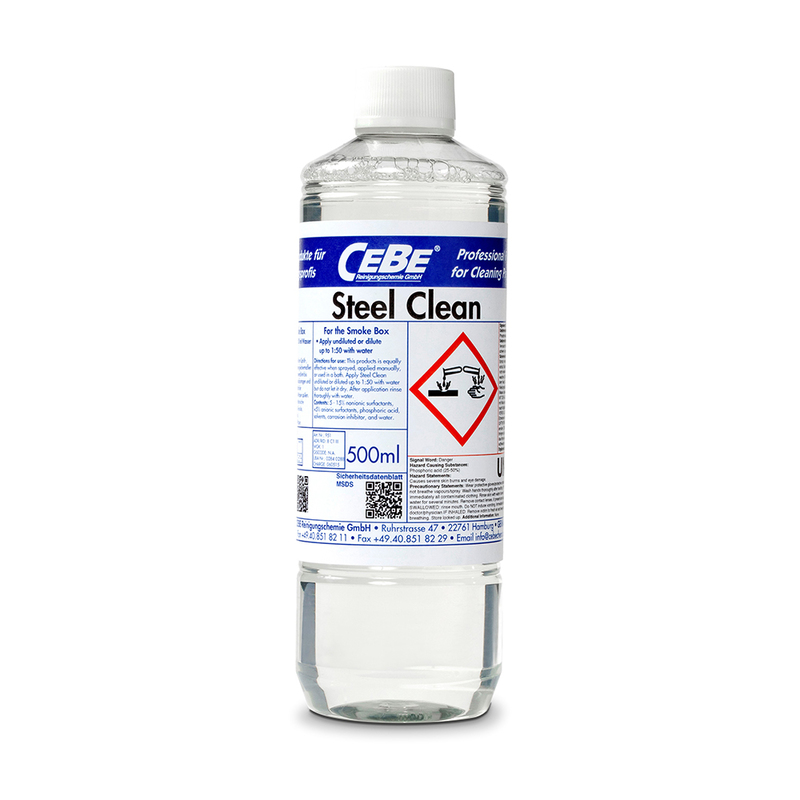 Use a suitable cleaning agent to clean and disinfect the water bath, we recommend this cleaning solution. Oven: The oven does not require any special maintenance. Keep it clean simply by using a soft cloth and effective cleaning products in the hospital. To avoid that the thermoplastic mask sticks to the bottom of the water bath, ensure that the water level is high enough. Also, check the temperature of the water with a thermometer to make sure it is between 65°C (149°F) and 70°C (158°F). To heat up bolus material you can use a net, which comes standard with the EU water bath. Always use the non-stick support rack to avoid that the mask sticks to the bottom or walls of the oven. As you can see, there are some differences between the water bath and the dry-heat convection oven. For example, the oven takes less time to preheat than the water bath, but the heating time of the masks is shorter in a water bath and the masks will not feel as hot. Another characteristic of the oven is that the moulding time of the mask is longer, which is an advantage for some and a disadvantage for others. 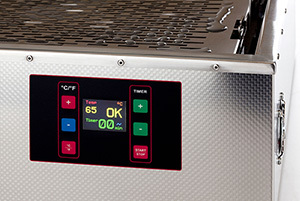 We hope that this overview helps you in making a choice between a water bath and a dry-heat convection oven. We want to stress that this choice depends on the personal preference of the radiotherapist and that both devices are effective tools for heating thermoplastic masks. Large waterbath with digital display with timer and thermometer – US standard. 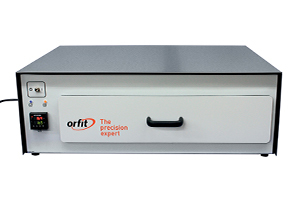 Large water bath with digital display with timer and thermometer – EU standard.